The blue boat is back sailing in Auckland, New Zealand thanks to the incredible behind-the-scenes effort by our team, our partners, the Volvo Ocean Race, and all of our suppliers. In Hong Kong, the team cooperated in the investigation while also evaluating available options to return to the race as soon as possible. The damaged boat was loaded onto a ship bound for New Zealand, thus the team missed out on the Leg 5 and 6 of the Race. 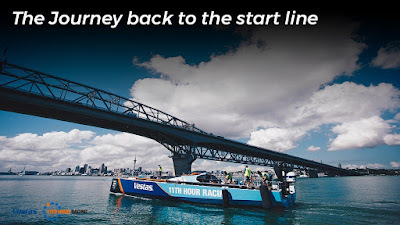 During the 2-week journey to Auckland, a new bow section was made from the existing molds at Persico Marine in Italy and transported to rejoin the hull in New Zealand, where the Vestas 11th Hour Racing shore crew, Volvo Ocean Race Boatyard crew, and local boatbuilders worked collaboratively and tirelessly to attach the piece. The boat was re-painted and re-launched on Monday, March 6th, and motored to the Volvo Ocean Race village in downtown Auckland where it was reassembled. The crew went sailing along the city front on Wednesday and Thursday for training and systems checks before lining up with the rest of the fleet for a Practice Race on Friday. On Saturday, Vestas 11th Hour Racing will be back on the starting line for the New Zealand Herald In-Port Race.